THIRUVANANTHAPURAM: Guinness World Book Record holder of the year 2008 for the largest collection of coins Mr. Justin Gilbert Lopez on Monday said coins of Travancore displayed the best quality in metal, etching and art. 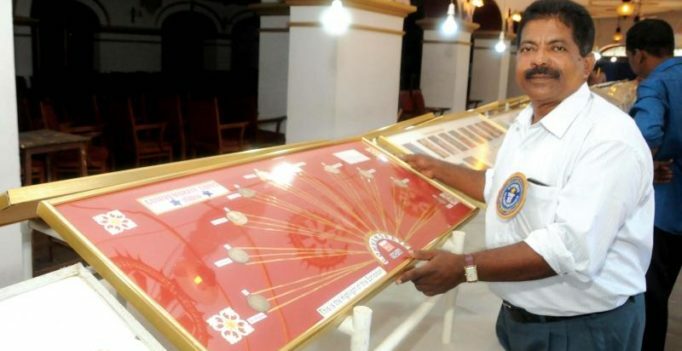 The Numismatist whose 3-day exhibition of coin collection is currently being held at Kanakakunnu palace told DC that he has been collecting coins since the last 50 years. “Among the 25000 coins I have in my collection, the best ones are of Travancore,” he said. The love affair began at the age of five when Mr. Lopez while playing on the sands came across a bunch of copper coins. This finally led him to breaking the 36-year-old record nine years ago. Some of the coins displayed at the exhibition go back to 1600. These coins are of gold, silver copper and mixed metals. Around 250 coins are on display. Apart from coins of various nationalities, there is a wide collection of classical coins. Coins of European settlers in India, Indian princely states and Mughal Empire, coronation coins, color coins, Princess Diana coins and guitar shaped coins of Somali Republic are rarest of the rare. Though Mr. Lopez is particularly proud of the “Kozhi Kashu”, coins struck by French settlers in Puducherry and the gold coins of Vijayanagara; he said that his favourite were the classical Greek coins for they displayed aristocracy. “Coin collection is not a hobby but a science that demands a lot of hard work and knowledge,” he said. Many children approach him for information and rare pieces to add to their collection. He opined that a coin speaks for its age, its culture and art. “We need to cultivate this hobby among the youth,” he added. Mr. Lopez wants to keep his collection of coins in a museum that is exclusively dedicated for the purpose. But ahead of doing that, he is keen to take the exhibition to all districts in Kerala.